I set up an experiment with a pendulum swinging on a hinge and the hinge attached to a small PMDC generator. The generator has no load attached and its output voltage is proportional to its speed of rotation. I swung the pendulum from 90 degrees and using a data logger I recorded the voltage of the generator (at 100 samples / second). I approximated the output voltage (and thus speed) to a decaying sine wave. To calculate mechanical rotating power using torque and angular velocity, can I simply multiply the instantaneous equations for both, or do I need to somehow do a dot product? The equations are shown below including the units. I've clearly gone wrong some where since I end up with watts*radians^2. Interesting, I ran another test with a resistive load attached to the generator. 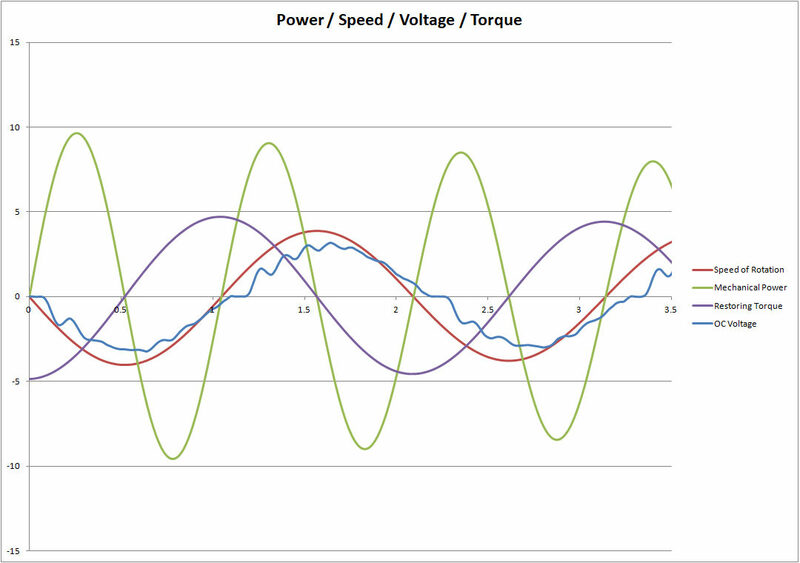 Max power occurs at max voltage which occurs at max speed of rotation. This maximum output electrical power actually occurs when there is apparently zero mechanical input power. How can this be? Obviously the pendulum has the most angular momentum at the base of the swing. Is it that I'm not taking into account the rotor inertia (which in this case is so small it seems to barely effect the dynamics of the swing). You should not proceed with any calculations when you realize that the units do not make sense. In order to make a better guess on the relation between quantities, look at the definition of the quantities. For example, "Power" is the rate of change of energy over time, so you should take rotational energy formula and take first time derivative of that expression to get "rotational power".